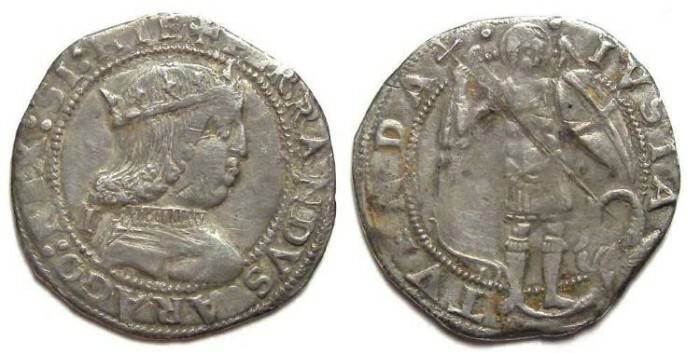 Date : 4th coinage, AD 1488 to 1494. Reference : M&C 1000+, 3rd class, 2. Size : 24.2 x 25.6 mm. Weight : 3.63 grams. Grade : VF, very slightly clipped. Obverse : Crowned head of Ferdinand with an I behind the neck, with FERRANDVS ARAGO REX SI HIE around. Reverse : Saint Michael holding a long cross with which he is spearing a dragon under his foot, With IVSTA TVENDA around.